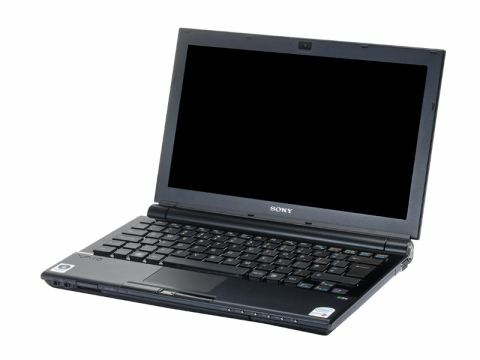 While consumers drool over Apple's MacBook Air, Sony has come up with a PC equivalent in the Vaio VGN-TZ21WN. It's much the same price as the standard hard disk-based MacBook Air and is designed as an ultraportable that's high on connectivity and low on bulk. It's a pleasing device to hold, with a screen just over 11 inches wide. Once illuminated you'll gasp at how refined the X-black LCD - Sony's renowned technology - really is. The detail in text and images is stunning and a resolution of 1,366 x 768 means that text is small, yet pin-sharp. The screen is also incredibly thin at just 4.5mm and very solid, too. While the MacBook Air sheds features in the pursuit of being super-thin, Sony's device retains almost every aspect a full-sized laptop has to offer. There's a wafer-thin optical drive, VGA input, two USB2 ports, Ethernet and dial-up connection as well as SD card reader/MagicGate, fingerprint recognition and multimedia shortcut buttons. There seems so little space to pack all this in, but some neat design means that it never feels cramped. The exception is the trackpad, which we found slightly awkward in that fingers moving upwards easily slide off the trackpad into the recessed keyboard. Even with practice we found ourselves falling into this gully almost every time and knocking the spacebar too often. The keyboard of the VGN-TZ21WN resembles both the MacBook variants and harks back to the days of early Spectrum 48Ks, with a spaced keyboard so that each key is set apart from its neighbour. It's incredibly comfortable and it's actually a wonder why this design went out of fashion years ago. Pressure-wise, the keyboard remains sturdy and responsive - exactly what we've come to expect from Vaio's classy range of products. There's no doubting the build quality here, but our test model had more than its fair share of tantrums. Blue-screening three times, Vista on this machine wasn't happy when we walked around with the machine, even carefully. Obviously, something wasn't quite right and we can only assume a loose component was the culprit. Designed for mobility, this Vaio is no graphics powerhouse. It's a workhorse plain and simple. With over four hours of battery life and remaining cool throughout on the high-performance setting, we were delighted with the Vaio's portability. Even Vista ran well on the slow clock speed of just over 1GHz on each core, and the 100GB hard drive is plenty for something this small. There's enough memory in there too, and wireless connectivity of every flavour - except N, of course. Benchmark testing told us very little. The onboard graphics and the slow clock speed doesn't make for happy reading on paper, but Office applications run smoothly despite this. For general use and portability there's little to groan about with this high-class machine, but the horror price of £1,200 is a stumbling block for most. However, machines like this are steadily coming down in price and although Vaio will always be a top-end brand name, we can expect to see better components for less cost in newer models.